Talk about a step back in time! I found this lovely at a garage sale here in Liberty this morning. The house was half of a block from William Jewell College, and the home was a gorgeous Century home with three stories, each 1,000 square feet. The man having the sale said he was downsizing. He didn’t look all that happy to be selling, but he was friendly enough. The sign came out of a diner in Excelsior Springs, Missouri. He bought it when the place closed for good. But he couldn’t for the life of him remember what the name of it was. It drove him crazy, like it was on the tip of his tongue. So the mystery, for me, still exists. He probably remembered the name as soon as I drove away. I love its simplicity. I love that it’s a little dirty and just a little beat up. I also love that there are tape marks over the .25 price for Malts & Shakes. And I love that this still exists! And that it’s still in Clay County! And that we know where it came from! Garage sales are so cool. It’s finds like this that keep me going every week. Busy day yesterday! I made the trek to Richmond, Missouri and on to Lexington, Missouri to check out the antiques and thrifting scene. I was so happy I went because, especially in Lexington, the antiquing was great! The day was beautiful and the town very picturesque. 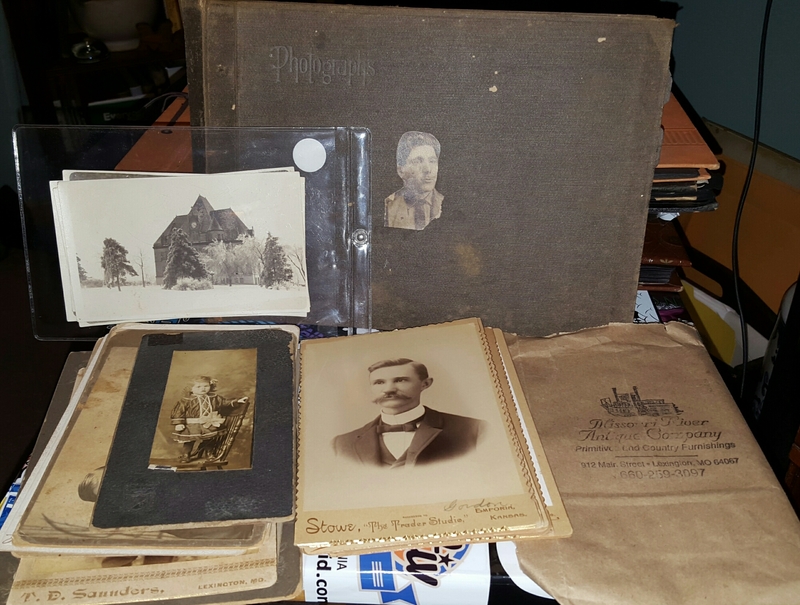 I was thrilled to find, in two different antique stores, several photos with names attributed to them for reasonable prices. I spent most of last night sending out emails to folks associated with some of them and today has me responding with the images. A super-great day for genealogy! Florence Liggett, by photographer Williams – Emporia, Kans. I might be a little weird. I get a charge out of buying old attributed photos and finding their family members to share them with. I don’t pay much for the photos, I’d say never more than $5 each. Since I’m a member of Ancestry.com, I’m able to take the information presented – usually just a name and location – and start digging for a match. Men are easier to track down because we women like to change our names to match our husbands’, but I’ve found some of the women too. Belle and Lulu Driskell caught my eye at an antique store on a business trip to Iowa. They were so naturally beautiful and the information on the back of the cabinet card photo was more than enough to track them down. Their married names were included, the city the photo was taken in was included, the date it was taken was even noted! I ended up getting in touch with someone who had posted their family tree on Ancestry and they were so excited. They said they had never seen photos of the sisters before, so I was doubly excited to share them. Isn’t Lulu gorgeous? I always offer to email the image to the family for no charge but if they want to buy the original they need to reimburse me. Most of the time they just want the scanned image, which is fine too! Mr. Meldahl just found his home this week, thanks again to Ancestry. It was also pretty easy to find him because his name is unusual, the city name is there and if I needed to dig really deep, I could find out when the photographers were in business in order to determine when the picture was taken, but I didn’t have to go that far. Cabinet Card of Frank Meldahl by Cadwallader and Loomis – Cor Market & 7th Sts. Parkersburg, W VA. All negatives preserved. Duplicates may be had at any time. Cadwallader & Loomis, The Photographers, 627 Market Street, above B. and O.R.R. Bridge, Parkersburg, W. Va.
Mr. & Mrs. Sproul were a little more difficult but not very. With the added “Mother Perkins” reference on the back of Mrs. Sproul’s photo, I was able to pinpoint a potential family. Just moments ago I emailed the images to a family member. Even without the location, it was a doable endeavor to track their family down. The Blackmans were SO EASY. I mean, check out the information detailed on the back! I had everything I need to find, verify and get in touch with their people quickly, and I sent off the image within a day of finding the family. I bought this little nugget of history at an estate sale in Baltimore a year or two ago. I grabbed it up out of reverence more than anything. I mean, the thoughtfulness of this guy to write down his family history and publish it for the ages – I admire Mr. J.A. Keck. This little booklet has additional family history dates and notes in the margins and attached throughout. My only hope in posting these images (and a considerable amount of SEO attached), is to draw a family member to this site one day. I’m saving it for you, Keck clan! You need only contact me to procure this fabulous piece of family history. I believe I bought other family photos from this sale. Just send me a note to get these in the right hands.